Here’s a question you may not have thought to ask yourself — Can the flooring in my home be making my family sick? A primary concern of indoor air quality is the emission level of specific volatile organic compounds (VOCs). Poor indoor air quality is caused by inadequate ventilation, poor cleaning or excessive emissions of VOCs. According to The World Health Organization (WHO), formaldehyde is considered a carcinogen gas, which can cause all sorts of health problems, including cancer. So what does that have to do with the flooring in your home? Since 2016 more and more attention has been put on formaldehyde found in all sorts of flooring options including laminate, linoleum, vinyl, and yes, even carpeting. If the news has you worried about the safety of the floors in your home, or if you are planning a renovation project and want to keep everyone inside healthy and safe, then it is time to learn some facts about today’s flooring options. If you have gone shopping for flooring products lately, you know how many options there are to choose from. 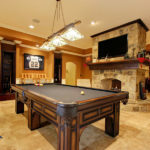 While they may look amazing, there are other things to consider when installing any new products in your home. For instance, dyes, adhesives, plastics, and even stain-proofing chemicals used to make and install new flooring can also present a hazard. While formaldehyde has been the top chemical highlighted in the news lately, there are other kinds of VOCs that can also off-gas, causing health problems in your home. When choosing that new floor, be sure to consider the risks. Carpeting may feel warm and cozy, but it can present a variety of dangers in the home. First, fibers easily trap dirt, dust, and bacteria, which can make you sick. 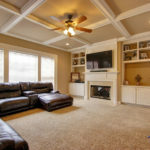 But, even if you can keep the carpeting in your home free from this kind of dirt, you have to be careful what it is made of and how it is bound and installed. Carpet fibers are often synthetic, which can cause off-gassing. Adding to that, the adhesives used to install it and even the dyes used to give it the right coloring, and you could be introducing a lot of bad stuff into the air your family breathes. Of course, that doesn’t mean that you can’t have carpeting in your home. Just be sure to choose wisely, opting for wool fibers, less dye, and natural binding and adhesives. Vinyl and linoleum floors have been popular for decades for several reasons. For one, they are relatively easy to clean. Plus, they can stand up to a lot of abuse from a busy family. However, with recent reports of formaldehyde emissions coming from these products, you have to ask yourself if the benefits outweigh the risks? According to most experts, linoleum seems to be the safer of the two choices, offering less off-gassing than vinyl, which is made from plastics and installed with VOC-laden adhesives. *Keep in mind that there are quality low and no VOC luxury vinyl options available. We recommend Shaw Flooring with the GreenGuard Certification. These products meet or exceed stringent indoor air quality criteria. Laminate flooring has become very popular in recent years. Cheaper and easier to care for than solid wood flooring, laminate offers a family on a budget a way to have the rich wood look without the cost or maintenance. But consider this: laminate can off-gas VOCs for months (or even years) into the air in your home. Solid wood, on the other hand, is a more natural product and is void of many of the synthetic ingredients used to make laminate. Plus, you can use nails to install solid wood, which erases the risk of off-gassing from the adhesives used to install other types of flooring. Ceramic Tiles – Is It Safer? When it comes to providing the most safety in your home, ceramic tiles may be the answer. Made of all-natural ingredients, ceramic flooring contains no dangerous chemicals and does not off-gas any VOCs. Just be sure that your installer uses a water-based thin set and a cement based grout to ensure ultimate safety in your home. 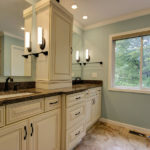 Ready to start into your next home renovation project? Don’t leave it up to an amateur who may not understand that every product they bring into your home could have dangerous consequences. 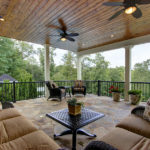 Call the certified green professionals at Quality Craftsmen for your home renovation in the East Cobb area. We have been specially trained as Earthcraft builders and Certified Aging In Place Specialists to provide the kind of information and safe product installation you need to keep your family healthy and safe.